In a bowl marinate chicken in garlic, rosemary, sage, salt and liquid seasoning for at least 1 hour or overnight in the refrigerator. Preheat oven to 350F. Roast chicken in a roasting pan for 45 minutes to 1 hour or until juices run clear. Remove chicken from overn and place on a serving plattr. Reserve pan drippings for risotto. In a saucepan, cook bacon until nearly brown. Set aside. Heat olive oil in same pan, and saute onion until translucent. Add muhrooms and heat through. Stir in rice, making sure the grains are well coated with the fat and oil, pour in the chicken drippings. A little at a time, while mixing the rice throughly. Add saffron. Continue to stir the rice, adding the stock a cup at a time over a 10 minute period. 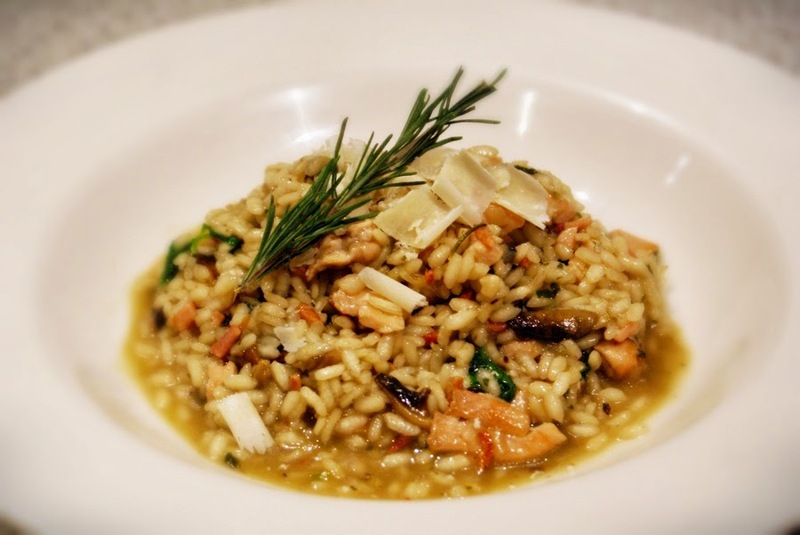 Risotto should look creamy, not dry. Season with salt and pepper. Transfer risotto to a large serving dish. Pour melted butter over it. Top with bacon cubes. Sprinkle with parmesan cheese. Serve with the roast chicken.